News for Week 5 of Feb 2014; the biggest news was the acquisition of Whatsapp by Facebook - I hope Whatsapp will proceed with charging yearly subscription for users, so that the industry will have a working model of low cost software subscription based on volume. PR - Feb 25, 2014 - HTC Aims to Create a Supercomputer with "HTC Power to Give"
WeChat, the world’s leading innovative mobile social communication application has engaged with a strategic partnership with Espressolab today, and announced the latest WeChat 5.2 updates which brought a series of new features such as a new Android interface refresh, Friend Radar, Real-time location sharing, Universal search, Photo album and many more. The partnership aims to provide users with the latest updates, announcements, offers and personalized messages from Espressolab to WeChat and coffee fans with the Official Account page, and a move to anchor further business opportunities in the nation. Following 140 percent growth over the past two years in terms of customers and bandwidth demand, Brisbane-based national ISP APEXnetworks, has selected the Brocade ICX® family of campus Ethernet switches and Brocade® NetIron® 2000 CER Series routers for its next-generation equipment within its distribution network and for deployment at customer premises, in Australia. APEXnetworks was approaching the limits of its existing infrastructure to cope with further expansion of its Metro Ethernet services. The company migrated to new data center facilities nationwide and introduced a new generation of Ethernet switching systems that could meet continuing demand, while improving service resilience and operational economics. Through Brocade, the company plans to redeploy, upgrade and grow its network with redundancy and high-availability solutions. Fusion-io today announced that Yelp, the company that connects customers with great local businesses, is accelerating its databases using Fusion ioMemory solutions. With Fusion-io enterprise flash memory, the Yelp Engineering team ensures that users can search and find local restaurants, boutiques and other businesses in an instant. Flash makes it fast for Yelp to deliver value-added services such as ordering from directly within the Yelp mobile application, fueling commerce through rapid database transactions. Fusion-io delivers the world's data faster. Our Fusion ioMemory platform and software defined storage solutions accelerate virtualization, databases, cloud computing, big data and performance applications. During a recent press conference held in California, SAP had announced the next steps toward delivering on its cloud strategy. Simplified pricing, deployment and accessibility options for SAP HANA herald a significant business shift to cloud-based consumption and pricing models. SAP announced new offerings for SAP HANA Cloud Platform. Customers now have the ability to choose from three offerings: SAP HANA AppServices, SAP HANA DBServices, and SAP HANA Infrastructure Services. Dimension Data, the USD 5.8 billion global ICT solutions and services provider, was recently awarded the FireEye 2013 Global Systems Integrator of the Year Award at the FireEye Momentum 2014 – the company’s annual partner and sales conference held in Las Vegas. The award recognizes Dimension Data for constantly being at the forefront of helping customers adapt to the modern threat landscape and help organisations create more secure infrastructure to combat today’s advanced threats. Translate Your World expands business with the addition of Dr. Chester W. Anderson III as Director of Business Development. Translate Your World (http://TranslateYourWorld.com), developers of linguistic and mobile marketing technologies, today proudly announced the addition of Dr. Chester W. Anderson III as Director of Business Development. As former head of the Advanced Products Group of AT&T Bell Laboratories, Dr. Anderson is a recognized leader in the speech technology industry, now throwing his quite considerable professional weight behind the startup called Translate Your World. Dr. Anderson holds a PhD in Geophysics from the University of Alberta, and both a MS in Physics and a BA in Physics from Wichita State University. At AT&T’s Voice and Audio Processing Center of Excellence, as head of the Advanced Products Group, Dr. Anderson led his team to develop and market the “BLASR Speech Recognition Engine” and called it Watson. 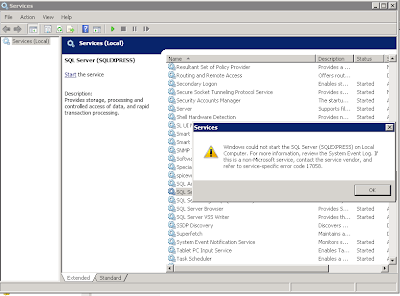 Watson was deployed both as a shrink-wrapped software product and as an OEM product to major computer manufacturers such as Acer. Dr. Anderson’s experience is not only with mature companies, but in the “start-up” environment as well. 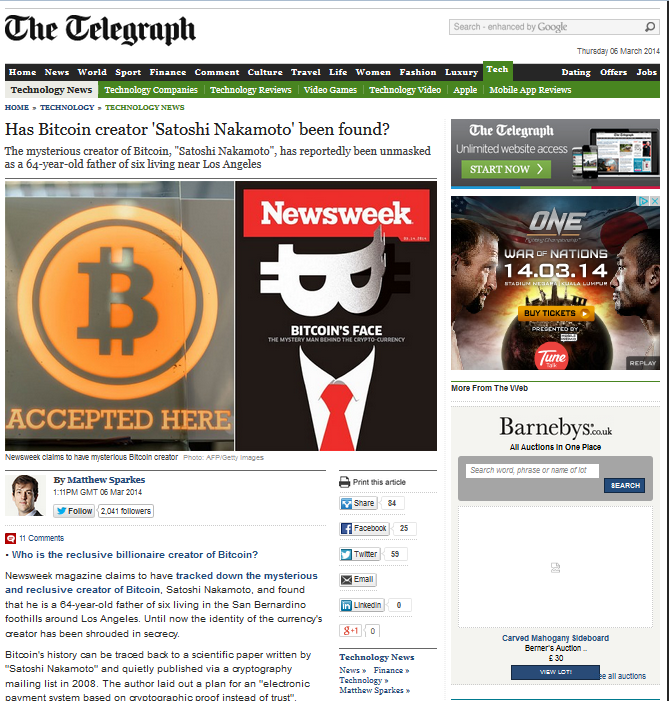 Telegraph reported that the alleged creator of Bitcoin, Satoshi Nakamoto has been found to be a real person. Long thought to be an alias, it turned out that Satoshi Nakamoto is a real person: a Japanese-American man living in LA, working as technologist and Engineer for high tech projects. The Bitcoin technology, which premises on software system as the foundation of trust instead of currency, allows two parties to transfer 'money' between each other without the compromise of fraud, based on the root that the system is fool-proof and cannot be compromised due to the supremacy of cryptography - in other words, you can trust that the money transferred between Bitcoin will not get lost somewhere and doesn't get hacked. On Feb 20, 2014, a bar in Austin setup the first Bitcoin ATM in the USA which is capable of dispensing cash based on Bitcoin's credit. As reported by USA Today, the ATM is at the Handlebar, a hipster hangout on East Fifth Street in Austin. The greatest achievement of Bitcoin is simple yet magnificent, that it works like a language; for instance, imagine that I give you one string as AHXYEFD234THDEFD which wouldn't make sense, however, if you interpret it with Bitcoin system, it will mean "You have $100". Hence, since it is not crackable, by giving you the string, you can write a Bitcoin software and interpret it and then use the $100 to do something else, such as transfer it to and withdraw it as cash from the ATM - all the secrets are stored within a string. 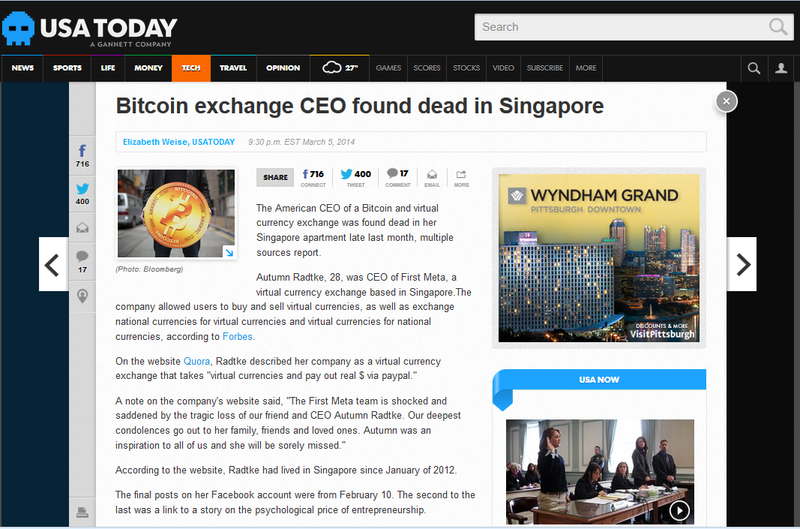 USA Today reported that Autum Radtke, the CEO of First Meta, a Bitcoin company based in Singapore, was found dead in her apartment. Rackspace, the open cloud company, has completed the deployment of Brocade Gen 5 Fibre Channel SAN solutions across its global data center network to accommodate explosive customer growth. The new Gen 5 Storage Area Network (SAN) has helped the company achieve greater density, flexibility and scale in connecting to high-performance EMC storage arrays, resulting in increased efficiency and productivity at each data center. Rackspace is a global leader in hybrid cloud computing and founder of OpenStack, the open-source operating system for the cloud. Brocade Gen 5 Fibre Channel SAN switches are now deployed in eight of Rackspace's data centers across three continents as a foundation to connect EMC storage and Dell servers to their customer's remote IT environments. Throughout the years, Epson, world leader in projectors, excites the market with projectors that exceed the consumers’ expectations and deliver high quality digital imaging solution. This commitment to quality and excellence has solidify Epson’s position in the market, as the company has achieved another milestone in receiving the title of ‘World’s Number One Projector Brand’! This definitely doubles the joy for Epson as the company is also celebrating the 25th Anniversary of their 3LCD Technology. As announced in the recent Malaysian budget, 6% GST will be introduced in Malaysia as of 1 April 2015. Given that it is just slightly more than a year away, there is a huge question on the readiness of Malaysian businesses in adopting GST especially the hugely-ERP reliant Manufacturing sector. According to iContro Sdn Bhd’s CEO Frank Lee, it is expected that there will be chaotic period as never seen before as companies rush to replace their unworkable legacy ERP systems to support GST. A survey back in 2012 found that 60% businesses self proclaimed to be GST reader while the remainders admitted that they are not yet ready. Ovum has released a new report “Technologies for Terabit Transport”. The analyst firm reports that the vendor and carrier trial activity in 400G and 1 Terabit systems jumped up in the second half of 2013, even as the commercial market for 100G ramps. But 400G+ capabilities on the market today heavily leverage 100G technology, bundling 100G or 200G channels into “superchannels.” Ovum warns of significant risk that transport costs will rise beyond these speeds due to unprecedented uncertainty about the technical roadmap. The continuous capacity scaling of the past two decades is coming to an end, with no guarantee of continued plentiful and cheap bandwidth. High-speed optical transmission is approaching a hard physics–imposed barrier called the nonlinear Shannon limit. As it becomes harder--and finally impossible--to the increase the capacity per fiber, more fibers must be lit at great cost. Expanding its ‘Power of Choice’ product portfolio and addressing the growing demands for robust and reliable surveillance systems in homes and offices, WD, the storage industry leader, has recently introduced the new WD Purple – a surveillance-class storage, 3.5-inch high-capacity hard drives. This new hard drive in line comes with high-definition video playback, and operates in 24x7 workloads of surveillance environments which caters the increasing demand for better surveillance security system to prevent break-ins and theft. Brocade has announced the appointment of Avnet Technology Solutions to expand its distribution network in South East Asia - spanning Singapore, Malaysia, Thailand, Indonesia and Vietnam; and deepen Brocade’s market penetration across the Government, Telecommunications, Financial Services, manufacturing and Enterprise Sectors. According to research and consulting firm BroadGroup, SEA markets will see sustained investment in data centers with a predicted 40 percent capacity increase by 2015. The continued growth is driven by many factors, ranging from the growth in mobile data to the emergence of the cloud and the market entry of many large-scale data center solution vendors. Additionally, Forrester Research forecasts that the Asia-Pacific cloud computing market will grow from US$6.9 billion in 2013 to US$31.9 billion in 2020, with the SEA region growing at a 24.7 percent compounded annual growth rate. 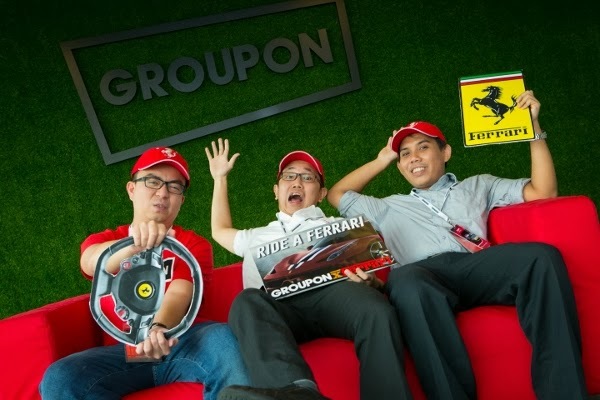 Groupon Malaysia recently organized the “Ride The Prancing Stallion” contest which rewarded 3 lucky subscribers with 2 VIP tickets to the Ferrari Racing Days, hot laps ride as well as Ferrari merchandise - subscribers Darren Cheah (32), Suzy Yap, (26) and Mohamad Faizal Zainol, (30) was crowned as winners of the “Ride The Prancing Stallion” contest which was presented by Groupon Malaysia. HTC, a global leader in mobile innovation and design, today unveiled HTC Power To Give™, an initiative that aims to create the a supercomputer by harnessing the collective processing power of Android smartphones.